All apologies from the Aleheads for our radio silence over the past few days. Our two most prolific posters, the Good Doctor and myself have been on extended sabbaticals which has limited our ability to enlighten and entertain Alehead Nation. While Doc chose the more altruistic “Family Vacation” approach by venturing to the Magic Kingdom with the Doclings in tow, Wifey McHops, Baby McHops and I sallied forth to Napa to participate in the nuptials of our dear friend, Goose. We also spent the preceding week in San Francisco, partaking in delicious food and even more delicious brews (well…Wifey and I at least…Baby McHops is still developing a taste for craft beer). My exploration of one of the great brewing regions of the US (surpassed, in my mind at least, only by Oregon) provided me with enough tasting notes and posting topics to last for weeks. And you, dear readers, will reap the rewards! That is, of course, if you consider my aimless, incessant prose to be any sort of actual reward (which you shouldn’t). An educated populace: Northern Californians in and around the Bay Area and Napa are highly educated and engaged when it comes to what they eat and drink. Local produce is championed both for its quality and minimal impact on the environment. A population that loves local produce provides ample incentive to develop good local breweries. Access to raw materials: Northern California, particularly Napa County and the surrounding region, is home to vast tracts of productive, rich farmland. While the area is most well-known (and deservedly so) for its grape production, it also has easy access to the ingredients that make up beer. While California is dwarfed in terms of overall barley production by North Dakota, Idaho, Montana, and Washington, it produces a substantial amount of the grain. And while Oregon and Washington are the dominant hop growing states in the US, California grows a large amount of the oily green strobile itself (actually, Sonoma County near Napa used to be one of the big hop-growing regions of the country pre-mechanization). A culture of innovation: Silicon Valley, Apple, Google, the inventive Napa wineries…Northern California is a hotbed of new ideas and envelope-pushing. The same is certainly true in the brewing industry where some of the best and brightest brewers are constantly stepping up their game and creating outstanding new beers year after year. History: You may think of the Boston Beer Company (Sam Adams) and Pete’s as the fathers of the modern craft brewing movement. But long before they were cranking out their wares, Fritz Maytag’s Anchor Brewing Company in San Francisco was challenging the palates of beer-drinkers in Northern California with their delicious brews. They were THE American craft brewery before the term “craft brewery” was even coined. With all of those positive attributes, it’s no wonder NorCal is such a mecca for Aleheads everywhere. While I’ve visited the area numerous times over the years (thanks to the presence of Wifey McHops’ sister and her family in SF), this was the first trip where I decided to make beer-hunting a priority. The results were, as you might suspect, amazing. While tasting notes will abound from my trek, the first order of business is discussing a brew that Aleheads the world over have been championing for years. 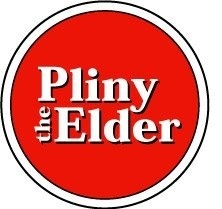 The #2 rated beer on BeerAdvocate (and the #1 overall American beer)…Russian River’s Pliny the Elder. Ah, Pliny (Note: It’s pronounced with a long “i” as I quickly learned after mispronouncing it for years). It was the first beer I consumed after touching down at SFO and the last beer I quaffed the evening before we returned to ‘Bama. And in between those alpha and omega beers, I consumed it another dozen times (both out of the bottle, on draft, and at the brewery itself). Unlike Westy 12, Pliny is fairly easy to get in the US (at least around San Francisco). It’s cheap (around $4 for a bottle) and you won’t find any ridiculously priced “aged” versions of it anywhere (the bottle itself clearly notes that the beer should be consumed immediately and never cellared). That’s the beauty of beer. Four bucks for arguably the best beer in America…and it’s available at Whole Foods and at a ton of neighborhood bars? Try that with the number two wine in the world (whatever that may be…I don’t know how they rank wine, but I’m sure it costs thousands of dollars). Now, of course, we’ve talked at length about the limitations of BeerAdvocate on this blog. While it’s an incredible resource and a must-visit site for any Alehead, the ratings have to be taken with a grain of salt. Is Pliny “really” the best American beer? For most people, probably not. When you’re talking about something as objective as beer, consensus is impossible. But what any beer lover can certainly agree upon is that it is absolutely a world-class beer and worthy of all the praise it receives. The best beer? Who knows. But a great beer? No question. At 8% ABV and 100 IBUs, the Pliny is a true Imperial IPA. It pours a gorgeous, cloudy gold color with a pillowy, bright white head and rock-solid lacing. The nose is 100% hops. Not an overwhelming, eye-watering blast of bitterness…but a well-crafted aroma of beautiful pine resin, grapefruit, and tropical fruit. The hops are so carefully calibrated that you can almost identify the individual varieties used in crafting the beer (if, you know, I was capable of such olfactory feats…which I certainly am not). Centennial, Chinook, Columbus, Simcoe, and Warrior are all used in the brewing process of the Pliny and it seems like Vinnie Cilurzo has somehow wrung every ounce of flavor and aroma from each variety in creating his masterpiece. The taste is, as the nose implies, incredibly hop-forward. But again, this isn’t an astringent, mouth-puckering hop-bomb. It’s certainly bitter…and the citrus and pine notes absolutely dominate, but there’s plenty of pale malt sweetness to keep the beer honest and very little alcohol on the finish. A beer this strong and hoppy has no business being this easy-drinking and accessible, but I honestly couldn’t get enough of it. It was served at the aforementioned Goose’s wedding and I saw at least a dozen young ladies bumping and grinding on the dance floor with a 500mL bottle of Pliny in their hands. Keep in mind that we were in Napa with access to top-end wines all evening long…and these women still went for the Pliny. That’s a pretty ringing endorsement if you ask me. Four hops? Well, yeah. There aren’t a lot of brews out there that live up to the hype…but Pliny the Elder is definitely one of them. I’ll have fond memories of all of the impossibly delicious brews I drank in Northern Calfornia. But the memory of Pliny will always burn the strongest in my mind (and on my tastebuds). Posted in Tasting Notes.Tagged California, Imperial IPA, Napa, Northern California, Pliny the Elder, Russian River. Couldn’t agree with Brother Barley more. It was a ridiculously good beer, but I was even more surprised to see just how accessible it was to drinkers of all types. I think Goose was a bit concerned that it would only pass the muster of the “hop-head” wedding invitees, but tons of people really enjoyed it. I’m pretty sure my favorite part of the night was when the bartenders stopped just giving you a single glass from a 500ml bottle and giving you both the glass and the rest of the beer in the bottle. Extra Pliny consumption! Glad Baby McHops is still in the developmental stage, and not there yet. Vested interest, you know? “the memory of Pliny”?? Seriously? You remember anything after knocking back 3 of those? I don’t. My bottle courtesy of Brother Barley arrived yesterday. I’m hanging onto it until the weekend to share with a buddy. Thanks for shooting this treat my way!!! Fuzzy memories count, don’t they? Actually, the problem wasn’t the three Plinys…it was the three Obsidian Stouts and three Old Rasputins after we ran out of the Elder. The only saving grace was that Goose chose not to have any liquor at the wedding. Smart move by a stupid man. It was the balance that amazed me. Nothing was overpowering about the taste. The hops and malts played off of each other perfectly. And the finish was crisp and clean. For such a flavorful beer, the finish had no indication of alcohol burn or cloying aftertaste. It just went down. I’m going to miss that beer. I would like to take credit for inventing “yes, I’ll take the bottle…” I’m not sure that I quite made it to a dozen Plinys on the weekend because it was really hard turning down all the “-ations” cheap and on tap, but I had at least 10. I’ll save my comments on the “-ation” beers for the posts from barley that I’m sure will follow. Although, I’m still not sure that Pliny is my favorite, it’s a damn good beer (definite 4 hops). You can get Pliny in a bottle at all times at my local watering hole along with the best double IPAs, so I plan to wait a week and revisit the beer along with a flight of other double IPAs. I’ll report back on my findings. I just came across this blog for the first time and, as an SF resident I couldn’t help but read the Pliny entry. Yes, indeed, it is a miracle of malt balance and hop-tastic flavor and aroma. We in San Francisco are incredibly lucky to have Pliny the Elder on tap and in the bottle in so many neighborhoods. Next time you visit, definitely check out Toronado, City Beer, and the Monk’s Kettle. I’m sure you already know about these places, but they are most definitely beer meccas worth visiting. Good luck remembering though! SF has some remarkable beer options, Joe. You’re pretty lucky in general just to live there! Although, I have to admit that I never really got the hang of separating my compostable materials from my recycling. Every city has its quirks, I guess. I’ve been to all three of your recommendations and, of course, loved them all. While I’ve been to Monk’s Kettle very often and Toronado a couple of times, this last trip was my first encounter with the City Beer Store. I will definitely be returning there during my next trip to the Bay.